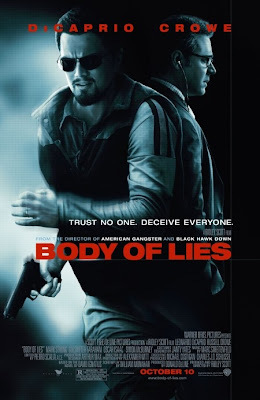 Watching ‘Body of Lies’(2008) was like watching an updated version of ‘Lawrence of Arabia’, except that the language is raw, the Toyotas had replaced the horses and Turkey is no longer a major player. Unfortunately the portrayal of the Middle East by film directors has barely evolved. While David Lean might have been excused in 1962, Ridley Scott’s vision smacks of laziness and repackaging. The narrative in blunt terms consist of: The Middle East is a hot and dusty place populated by a majority of semi ignorant and brutal individuals, mostly of the male variety. But even if we accept the usual Orientalist clichés as the only possible way for the Arab world to be represented in Western popular art, a number of puzzling elements still stand out in the scenario and the making of the movie. For these I am not sure whether to blame David Ignatius, the Washington Post ‘Middle East expert’ behind the book of the same name or Scott, who directed the movie. Again, the myth of the astute Westerner who blends into the local society by sporting a beard, learning the language and wearing traditional Bedouin garb is revisited. While Lawrence might have had a chance on a Camel, Leonardo emerging from a van to lure informers is far less convincing. Another interesting twist is that Agent Roger Ferris (DiCaprio) falls for a local woman and approaches her in a casual, almost callous manner, which must have gone against the Langley rule book. The woman in question is an unlikely character. The daughter of an Iranian exile, she works as a nurse in a Palestinian refugee camps. You get the sense that the character was designed to fit the actress (Golshiftheh Farahani) who originally hails from Iran. Her behaviour is even less likely. While she hesitates to shake the agent’s hand under the judging eyes of her neighbours, she happily chooses to sit with him in an open air popular cafe despite the stares of Arab manhood in the background. This uncomfortable attitude towards this culture is best exemplified by the choice of actors for indigenous characters. The main Arab ‘hero’ is Hani Salaam, chief of the Jordanian secret services, played by actor Mark Strong, born to an Italian father and Austrian mother (Wikipedia). Hollywood still struggles with fitting Arab actors to play central positive Arab roles. And while some Israelis are brought in to impersonate Arabs, every character played by an Arab actor (mostly Arab Israelis or North Africans) is either a villain or a victim. In terms of the broader lessons from the movie, the cavalier attitude of Ed Hoffman (good performance by Russell Crowe) is memorable. The Senior CIA operative is shown going about his middle class all American suburban life while organising targeted assassinations in Baghdad, destroying any illusion on the way the US behaves on foreign soils. I will not dwell on the plot since ‘Body of Lies’ is still a movie worth watching as adrenaline generating light entertainment, keeping in mind that the critics did find it quite predictable as a spy flick. But on every other count it is a forgettable enterprise, a bit like the Liberation of Iraq. It seems that those who advised Scott have much in common with those who advised Bush on the Middle East, resulting in a catalogue of errors. I wouldn't have paid a cent to watch this movie but it was staring me in the face on a recent flight back Beirut. You are absolutely right, it is laziness. After all, who is going to complain. This depiction of Arabs is standard fare in American movies. But Joseph, I have to disagree with you on the notion that the film depicts Arabs as 'ignorant and brutal' and totally misrepresents Arab culture. All of the key Arabs in the film are actually pretty savvy, and more likeable than their American counterparts (including the terrorist Saleem- one of the more multidimensional villains I've seen in a film, and certainly not the kind you would expect in a Hollywood production about modern terrorism). Additionally, I think the film does a great job in taking DiCaprio's character to different parts of the Middle East in order to remind the less informed viewer that everything isn't sand and hot dust in the Middle East. We see regal Amman, Palestinian refugee camps, Dubai hotels, and Iraqi souqs. Given the film's subject matter, the makers can't be faulted for not also showing us schools, ahwas, and shisha cafes. Regarding the issue of Roger Ferris' careless approach towards the Iranian nurse Aisha: This was the part that threatened to make this film most like another mainstream Hollywood piece of trash. Ferris knows full well the kind of danger he can cause Aisha, but callously pursues her nonetheless, even having coffee with her amongst a staring group of Palestinian men. And if this breech of the spy code is not enough, he totally throws out the book when he jeopardizes his mission, life, and the lives of others to go save her from the terrorists in true 'Titanic (insert whatever other silly romance)' fashion. But just as he is going to die a glorious death attempting to save the one he loves, Hani steps in. And with his arrival he has this message: "and if you had died [in that room] I would have told her what you did for her. And she would have loved you forever. Whereas now, you're going to have to earn that right." Herein lies the entirety of the movie's (novel's) message. Respect and love have to be earned. They don't come on the back of one or two supposedly courageous deeds, but rather, as Hani says, through learned through trust. Something that Ed Hoffman, nor the current American policy makers, haven't fully understood. What remains to upset me, however, is the fact that films like this (or maybe also those about how miserable Arab womens' lives are) are the only mainstream ones in which Arab culture is visited. But given the film's subject, I think the team did an excellent job. Except, of course for casting an Italian-Austrian as a Jordanian. Thank you for your comment. I appreciate it specifically because you approach the movie from a different angle. I take on board the subtilty of the words delivered by Hani to ferris.Didnt really cross my mind at the time, but I wonder how many average Americans did actually get it. I have to say I usually enjoy Ridley Scott's movies and even Black Hawk Down made good viewing despite the ultra-American perspective on the relevant events. When I criticise a movie such as 'Body of Lies' I am aware that Hollywood might not have a duty to portray Arabs (or any other people) as they are, in their diversity and their complexities.At the end of the day it is a money making exercise whith entertainment at its heart and not education. But the tragedy is that most likely those in charge of US foreign or defense policy adopt a similar view. Until they become more discerning, their impact in the region will always be problematic(as shown in the movie). I agree that the movie was superficial. However, what movie based on a book isn't? The book does go into detail about Arabic culture which is pretty rare in western novels. Maybe I am biased because at the age of 54, I discovered that my great father immigrated to the US not from Ireland as I had been told, but from Syria and that our name was derived from Ras al Metn in what is now known as Lebanon. Ferris discovery, as prompted by Hani, of his Arab roots was pretty fascinating to me. Explaining modern day infighting between Syrian/Lebanese groups is very difficult and I have to give the author some credit for at lest trying.